Thomas Gibbons has been the playwright-in-residence at InterAct Theatre in Philadelphia for about two decades now. 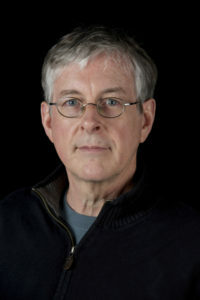 His plays have been seen at the National Playwrights Conference at the Eugene O’Neill Theatre Center, off-off-Broadway at Blue Heron Theatre, Mixed Blood Theatre, Northlight Theatre, Actors Express, Florida Stage, Unicorn Theatre, Repertory Theatre of St. Louis, Arizona Theatre Company, Center Stage, New Repertory Theatre, Aurora Theatre, Roundhouse Theatre and many others. He is the recipient of seven playwriting fellowships from the Pennsylvania Council on the Arts, a Roger L. Stevens Award from the Fund for New American Plays, a Barrie and Bernice Stavis Playwriting Award, an NAACP Theatre Award, two Barrymore Awards for outstanding new play, and a Pew Fellowship in the Arts. Gibbons says he hopes audiences will leave the theatre with “some questions” after seeing one of his plays. That is definitely the feeling our audiences will leave with after seeing Uncanny Valley at International City Theatre. We think ICT audiences will be talking about this play long after it ends, because the material is so timely and so universally relevant. In a world where technology is becoming more and more advanced, can innovation go too far? How far is that? Is it possible for a robot to have or understand feelings? Are feelings and emotions what make us human? What is the future of life as we know it? This entry was posted on Monday, March 27th, 2017 at 3:17 pm	and is filed under Uncategorized. You can follow any responses to this entry through the RSS 2.0 feed. You can leave a response, or trackback from your own site.